The HIPLA 3D printer filament (High Impact Polylactic Acid or polylactide) is a modified PLA polymer in order to obtain better impact resistance than regular PLA. Furthermore, HIPLA filaments may have an aesthetic effect akin to the typical silk glare! If you have not tried HIPLA filaments yet, you have to try them today! The HT-PLA High Temperature 3D printer filament (High Temperature Polylactic Acid or polylactide) is a modified PLA polymer allowing to obtain better heat resistance than regular PLA. Regular PLA can begin to melt under direct sunlight, not HTPLA. 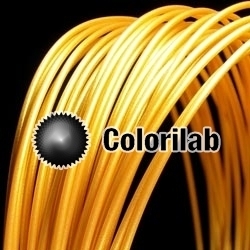 If you have not tried HTPLA 3d printing filament yet, you have to try it today.